Honestly, I can't remember the last time I fell this in love with a restaurant at first bite. Vij's Rangoli. Is. Amazing. Before I get really in-depth with the review, I just wanted to say they do not take reservations and parking is kind of hard. Other than that, I have nothing but praises to sing about this place. First the ambiance and the wait staff are amazing. The decor is definitely bright and modern and they incorporate lots of glass and stainless steel into the restaurant, and yet with all the cold surfaces and metals...the decor still looks welcoming and cozy. The restaurant itself is very small, with only about 10 tables, and a small patio area. The left side of the restaurant is dedicated to Vij's fresh packaged food. So if you can't go to Vij's or there are too many people (as it is often very crowded), you can grab a bag of lamb curry, take it home and heat it yourself. There was no room inside the restaurant, so my mom and I decided to go eat out on the patio with the promise that we would be moved inside once a table freed up. I was dreading eating outside, since it was so cold that day, but the industrial heater and the complementary fleece blankets did a wonderful job at keeping me and my mom warm. To keep our palates watered and our dishes company we ordered some drinks to sate our ravenous hunger. Like the logical person she is, my mother ordered the hot chai tea and I, being crazy, ordered the cold mango lassi (while eating outside on the porch in extremely cold weather.) The Chai tea was very nice. While some chai teas can be bitter and others overly sweet, this one was in the middle. Goldilocks, if she were a fan of chai tea, would be very happy. For those unaware of what a "lassi" is, it's a traditional Punjabi yogurt based drink and it can be sweet or savory. Generally they are very delicious. My sweet mango lassi was no exception, albeit it was a bit cold to be gulping the whole thing down like I did, I still did it. It was thick and had just the right amount of tart from the yogurt, but was also sweet from the natural mango flavor. You always know when a lassi is done right when the straw sticks straight up out of the drink. MAGIC. However the Portobello mushroom red bell pepper curry, although the title is a mouthful, is divine. Usually when I go out to eat I have carnivore tendencies, but this dish woke up the vegetarian in me. It's an altogether creamy, spicy, delicious, curry. The curry is not overly SPICED, but instead focuses on the harmony between the mix of spices and the coconut milk. The portobello mushroom and red bell pepper were both deliciously juicy and ridiculously satisfying and the paneer, a Indian cheese, added another kick of tart creaminess to the dish. The beet salad was fresh and helped to break up the heavy creaminess of the portobello and red peppers, and everything worked together in complete harmony. The naan was delicious too, but I always love naan. =P If I was a business major I would say that this dish had synergy. I strongly recommend going to Vij's Rangoli...the word that most describes this restaurant is harmony. The decor, cuisine, and the combination of the young, hip waitstaff with the older traditional cooks in their glass walled kitchen all work together to bring absolute deliciousness to your dishes. Eating here was truly a pleasure and now I'm even more excited to go back home and try Vij's during their dinner rush. =) I've heard it's even more delicious. This review makes me want to fly over there and give it a try, but sadly, that is impossible. The pictures of the food's making me salivate. I like how they provide fleece blankets, that's very thoughtful. Is that (straw standing straight up) really how you know if it's good mango lassi? 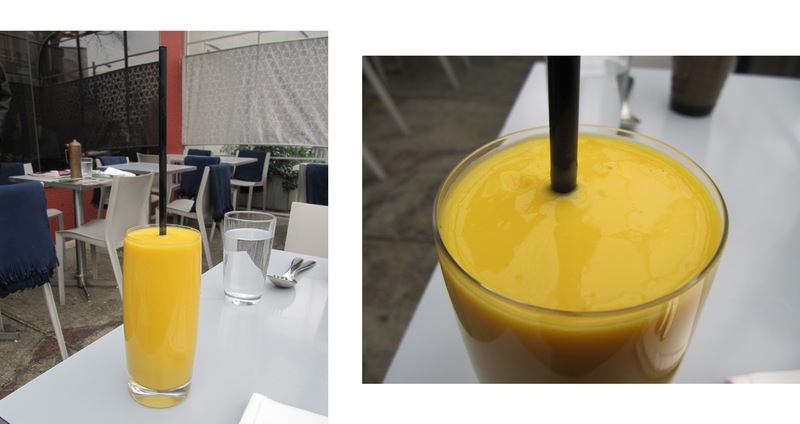 I lurve mango lassi, I always have it with curry. my mouth started watering halfway through!